1 : 2100000 Colton, G.W. 1 : 1267200 Colton, J. H.
1 : 633600 George N. Colby & Co. 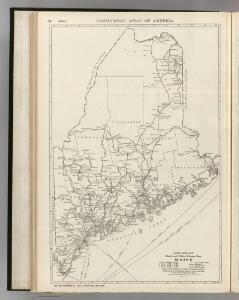 Shell Highway Map of Maine. 1 : 1262000 Johnson, A.J. 1 : 1750000 Lucas, Fielding Jr.
1 : 26000 Colton, G.W. 1 : 1250000 Colton, G.W. 1 : 1950000 Buchon, J. A. C.; Carey, H. C.; Lea, I. 1 : 1960000 Lucas, Fielding Jr.